That is some of the locomotives that are used to haul CP's luxurious & famous passenger excursion train called the 'Royal Canadian Pacific'. In your photo I can see locomotive # 3084. 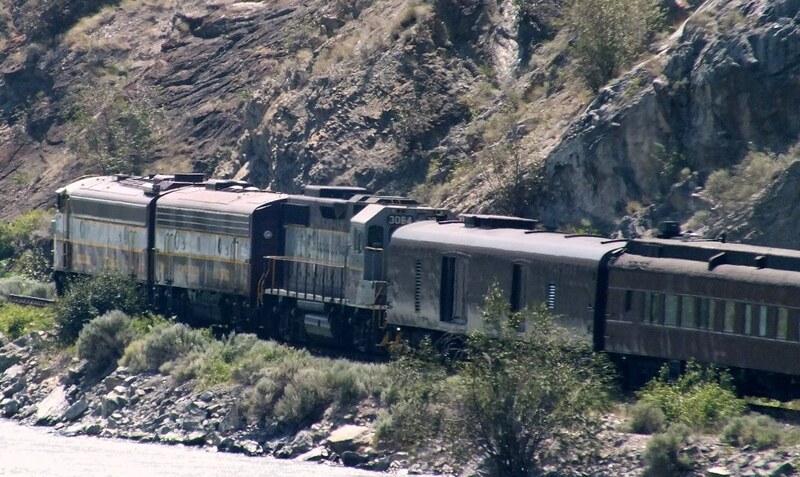 That locomotive was in the consist (along with 4106 & 4107) in this photo I took last June just north of North Bend on the CP main line in the Fraser Canyon. Today, near Spences Bridge BC, I saw the "Royal Canadian Pacific Express" special passenger train, south/west bound on the CN line. We were driving north on Hwy-1, the train was coming towards us and we soon figured out that it was "special", from a distance, because of the old locomotive. It passed us, just as we came to a pull-out area, and we quickly stopped the car, got out cameras, and started shooting. 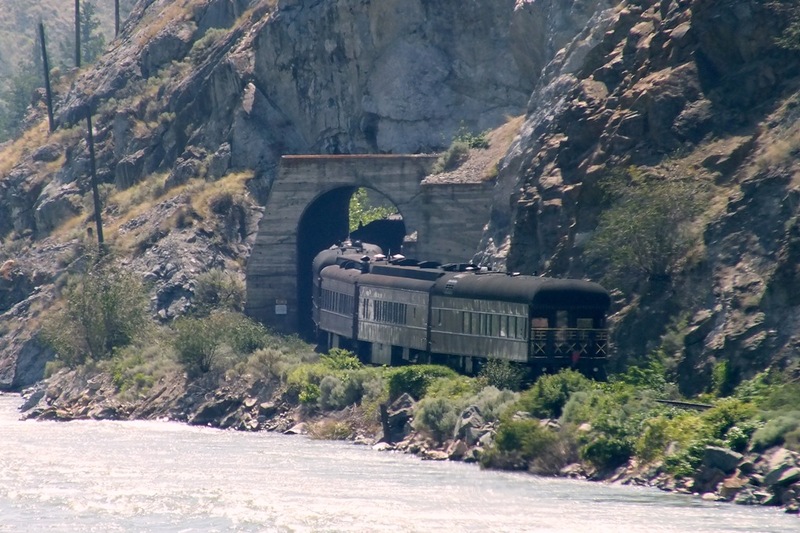 By then, she was set to disappear into a tunnel alongside the Thompson River. 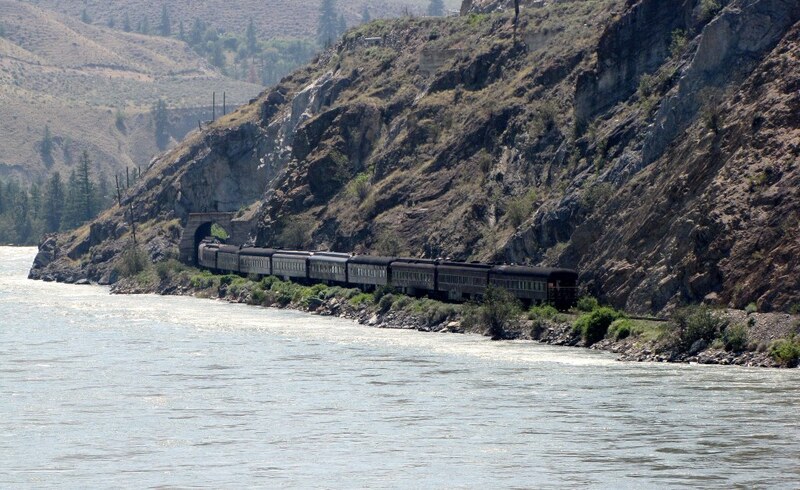 Some close-up crops of my sighting of the CPR Royal Canadian Pacific train, on July 8, 2012 near Spences Bridge, BC. 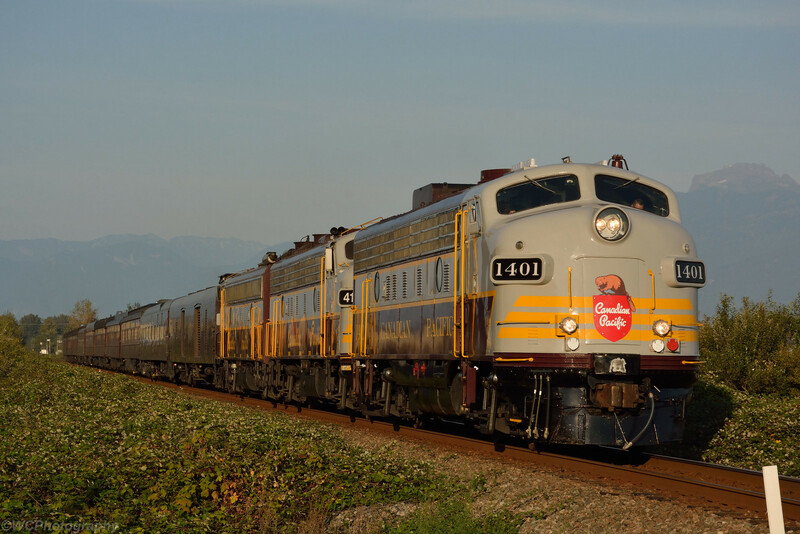 A fellow by the name of Ed Miller has a number of YouTube videos of a trip he did in 2012 on Royal Canadian Pacific. ...and if you listen to him talk to himself as he's filming, you'll realize that he's a similar type of rail-fan to the fine detailed, extremely focused ferry-fan that we are familiar with. He sounds like what I would likely have sounded like, had I taken this trip. ie. having the schedule memorized, knowing what rail bridges/tunnels are coming up next. Canadian Pacific's Royal Canadian Pacific train is seen west of Chilliwack on CN's Yale Subdivision, bound for Port Coquitlam. Any idea of why this vintage entourage was on the move 'Mike'? Great shot of yesteryears' Canadian Pacific. Most likely, somebody paid the big bucks to charter this train, and seeing as there were no passengers on board for the westbound trip, that charter will begin on the coast and head east. 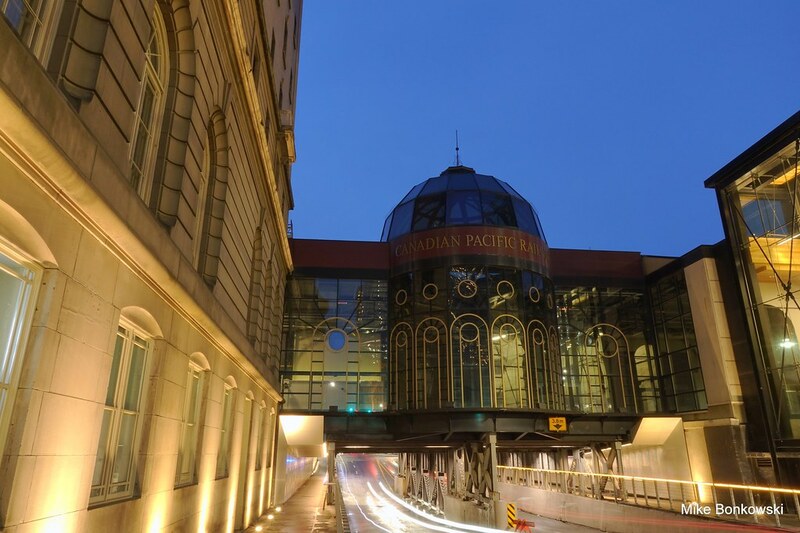 Just a bump-reply to show that I've merged the RCP recent posts into our existing Royal Canadian Pacific thread. A few years ago, I came pretty close to pulling the trigger on a RCP trip, back in the days when they sold some spaces "by the cabin." I waited too long (all the single cabins were sold out), and that turned out to be the last year of "by the cabin" sales ever. It was 100% charter train thereafter. 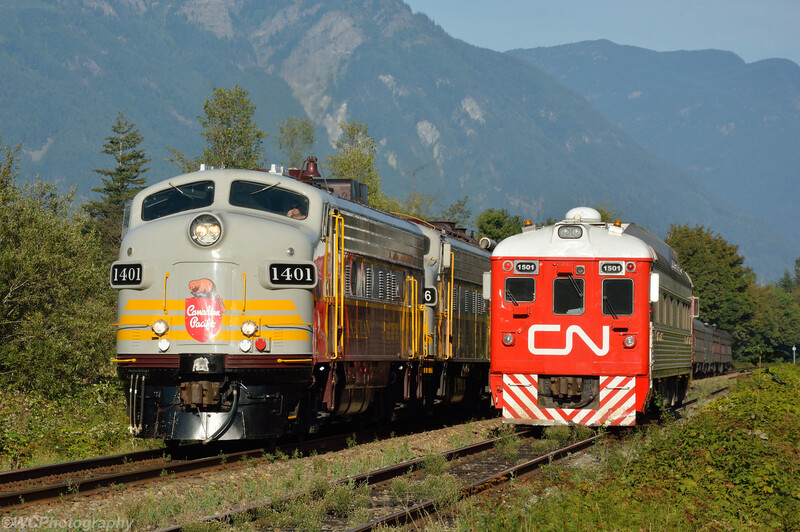 The trip would have been Calgary to Vancouver, with overnights spent on sidings at Banff and Revelstoke and maybe Kamloops. Honestly, it was a bit unexpected surprise. I had seen some chatter on the RailsAB facebook page on Monday, that the RCP was westbound at Calgary. 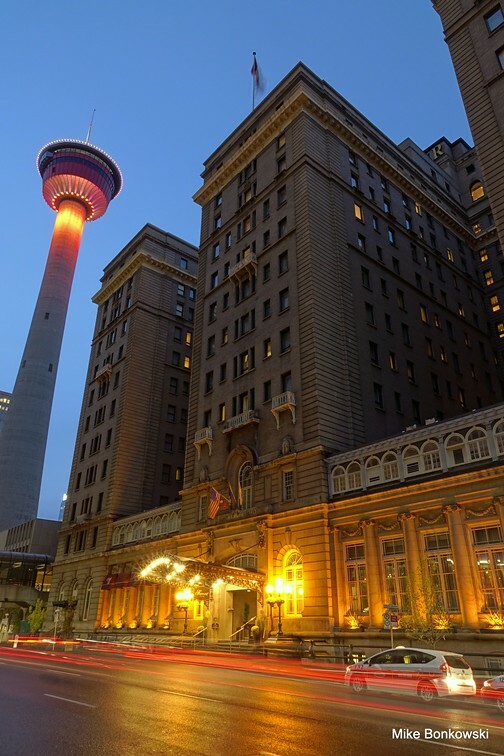 I didn't see anything more mentioned, so I didn't pay it much attention since they often do short trips from Calgary to Banff and return. Then I was out in Hope yesterday photographing a rare eastbound movement on CN, the CN 1501 TEST train. While it was pulling into the siding to clear a westbound grain train, my radio scanner came to life with "CP 1401 west, stopping at Mile 42", which was only 2 miles east of where I was standing. 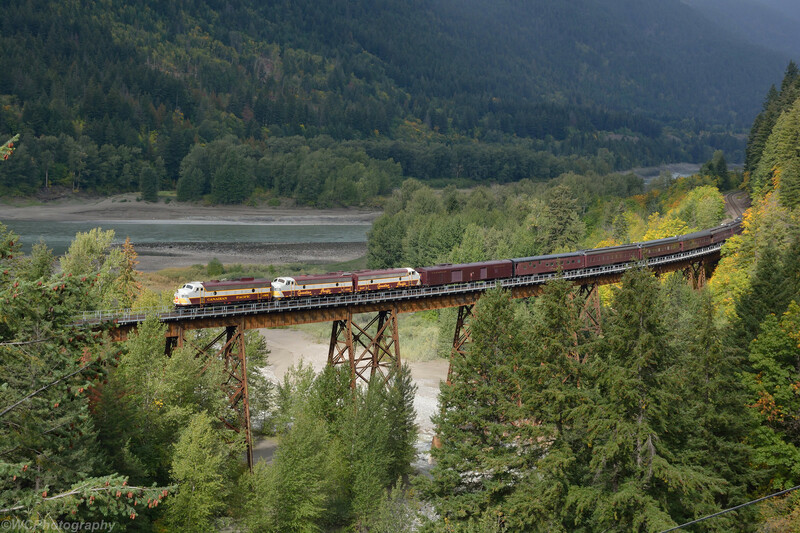 CP 1401 leads the Royal Canadian Pacific across the Anderson Creek bridge south of Boston Bar, on the CN Yale Subdivision. September 23, 2018. I'm curious about three locomotives at the head of what looks like a seven or eight car train. Anyone have any insight into that? I would suspect redundancy in the event of a mechanical failure. At the prices they charge for charters and individual fares, no delays would be tolerated! Standard procedure is to have three locomotives pulling this train. They're fairly low horsepower locomotives, so it's necessary to have multiple of them. Plus having multiple locomotives prevents the train being stranded if there was a failure on one of the locomotives. Adding to what Mike has said, I think that these old locomotives are maybe 1700 hp each. Compare that to most modern freight locomotives at 4400 hp each. You also have to consider the steeper grades that are present on the CPR lines in BC & Alberta. Uphill grades that in some places exceed 2% are found in several locations on CP's lines. Most notable is the climb over the Selkirk Mountains. The train, though short, must have the power to handle those grades. 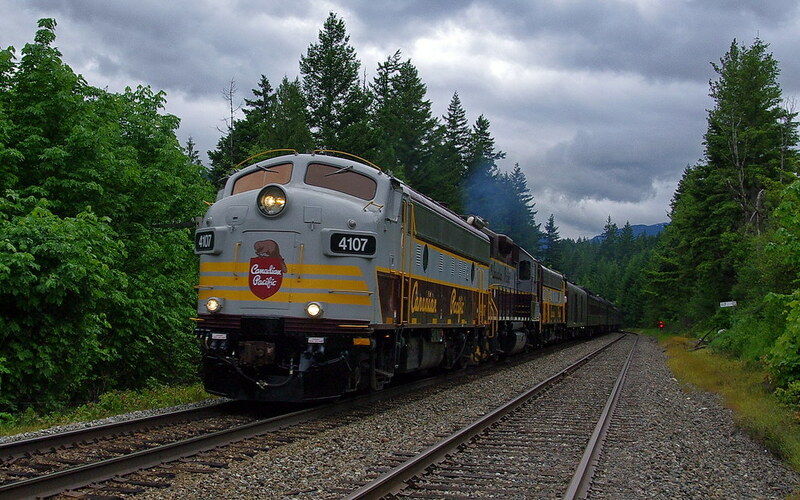 I believe that CP does not allow passenger trains to use the Macdonald Tunnel under Rogers Pass & must use the older Connaught Tunnel route when heading both east & west. Three of these small heritage units is probably about right, & allows for redundancy if one unit is not operating at full power.